A cheap ($100,000-$125,000 or thereabouts) sci-fi thriller starring Michael Rennie of The Day the Earth Stood Still fame, Cyborg 2087 (1966) is the type of picture one expects to be flat-out awful if not downright unwatchable, in line with most other ultra-cheap sci-fi films of the 1960s. Instead, many genre fans will be delighted to discover Cyborg 2087 is far better than its reputation would suggest. It's not exactly good, but it is reasonably well paced, never boring, and decently acted, with a sincere, sometimes imaginative screenplay that strikingly predicts James Cameron's later The Terminator and Terminator 2: Judgment Day. Harlan Ellison's two teleplays for the TV series The Outer Limits, "Soldier" and "Demon with a Glass Hand" are usually cited as plagiarized influences on those pictures, but one can't help but wonder if Cameron had likewise seen Cyborg 2087, which uncannily matches plot elements with the Terminator movies. Cyborg 2087 is definitely not a film for general audiences and, owing to the low budget the movie certainly has its share of unintended laughs, but for those like this reviewer willing to give ambitious and sincere productions a fair amount of leeway, Cyborg 2087 has its good points. In a repressive future society of 2087, renegade scientists (including, of all people, Jo Ann Pflug) send cyborg Garth A7 (Michael Rennie) back through time aboard a thermos-shaped capsule to the year 1966. His mission? To prevent Professor Sigmund Marx (Eduard Franz) from unveiling his military-funded thought projection-mind control device, an invention that by 2087 is used by the tyrannical government to oppress the general population. There's a clever idea early on, though it's not certain whether the filmmakers were even aware of it or its possibilities. When Garth arrives in 1966 he's surprised to first come across an old west town from the late nineteenth century. It's not clear whether the filmmakers intended it to be a ghost town or a Hollywood western movie ranch (some of the "buildings" are clearly flats). Arriving at Marx's laboratory, Garth is disappointed to find the professor away, and in the name of expediency confides his mission to Marx's assistant, scientist Sharon Mason (Karen Steele). In another imaginative touch, the script avoids loads of time-wasting exposition by having Garth reveal all through Marx's newly invented thought transmitter. He also warns her that "tracers," assassins from 2087, will be able to track him through a device in his circuitry that must be surgically removed. She thus takes him to the home of a colleague, Dr. Zeller (Warren Stevens). Garth's actions and those of the tracers (Troy Melton and legendary stuntman Dale Van Sickel) hot on his tail attract the attentions of the local sheriff (Wendell Corey), reporter Jay C (Harry Carey Jr.) and others. Can Garth stop Marx from unveiling his invention in time? Can the future be altered? Cyborg 2087 has its share of unintentionally funny moments. In an effort to appear inconspicuous, Garth dons a heavy overcoat and fedora, but continues wearing his silver space boots, which only serve to make him more conspicuous. The tracers wear high-tech tracking devices, like wristwatches, but close-ups reveal these as dime-store compasses. Nevertheless, they're constantly running in unison staring into these devices, like obsessed commuters late for their morning trains. The picture is decently paced, but briefly digresses when Dr. Zeller's teenage daughter returns home with several friends and they decide to dance to rock-and-roll records in the living room. Not only are these alleged teens so clean-cut they make Archie and Jughead look like hooligans, but when they all dance it's a dead-on, live-action recreation of the Peanuts gang dancing in A Charlie Brown Christmas. But the most startling lapse of good judgment comes early, when Garth first steps out of his time capsule. Though in his late 50s at the time, the 6'3 1/2" actor was still handsome and lanky thin. The film's costume designer fitted him with a flight suit reminiscent of that worn by his Klaatu character in The Day the Earth Stood Still, but apparently neglected to provide Rennie with adequate undergarments, particularly around the crotch. Subsequently, even fans of Rennie get to see a lot more of the actor than anyone would have wished for. "Is that a Gort in your pocket or are you just glad to see me?" It's probably giving writer Arthur C. Pierce too much credit to call his script for Cyborg 2087 an earnest plea against the scientific development of technocratic weapons (the antinuclear World Academy of Art and Science was in the news at this time), but it's undeniably there, and Dr. Marx's shifting attitude toward his taxpayer-financed discoveries is interesting. And while the premise of time travelers from a dystopian future trying to alter time in our present wasn't new, the basic plot having already appeared in many forms in written science fiction and in comic books, this may have been the first theatrical feature to dramatize this specific idea. The acting is reasonably good, with Rennie playing a character superficially similar to Klaatu but otherwise entirely different. Karen Steele and Warren Stevens are better than serviceable, and Harry Carey, Jr., worlds away from John Ford's stock company, is even better as the superfluous reporter. The production is cheap but not threadbare, and there's even a bit of action (staged with an obvious double for Rennie) and a few modest special visual effects. The score is credited to Paul Dunlap, but much of it appears to have been stock music, one cue instantly recognizable for its later reuse in Night of the Living Dead (1968). 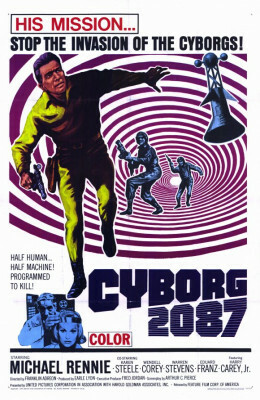 Cyborg 2087 was intended as a direct-to-TV-syndication feature, but theatrically released based on its commercial viability. It's presented here in 1.85:1 widescreen, and as it was shot in 35mm, the 1080p transfer is pretty good, better certainly than it has ever looked since its earliest theater bookings. The mono audio is fine and the disc is region "A" encoded. The lone supplement is a perfectly dreadful audio commentary by "writer and filmmaker Chris Alexander." He opens with comments arguing Tim Burton's Batman Returns is the best film in that series, then segues into bellyaching about the challenges of doing commentary tracks for Kino no one else wants. He cites a recent track for Curse of the Faceless Man as being particularly difficult because no one involved in that production "was still alive." Hopefully the still-living star of that film, Richard Anderson, doesn't get wind of this track. (Anderson died August 31, 2017, at 91.) Alexander then bemoans the fact that he had no better luck with director Ted V. Mikels, who died after he recorded that commentary track. Wait - what? I couldn't bear to skim through more than 20 minutes of this miserable, embarrassing, self-indulgent, uninformed, and technically badly recorded track, maybe the worst I've ever encountered. My understanding is that Kino pays its commentators peanuts, but I've heard amateur podcasts more professional than this. If indie Blu-ray labels can't make it financially worth the whiles of top-tier commentators like Tom Weaver or Tim Lucas, at least they should exhibit some discretion when hiring the less experienced, and actually have them pitch outlines or scripts before hiring them. Cyborg 2087 turns out to be a modest but genuinely pleasant little surprise, a better-than-it-ought-to-be "B" that forgiving sci-fi fans will enjoy. Recommended.